Instead of changing the focus, you can also combine different dimensions in order to get a more detailed picture of the process. 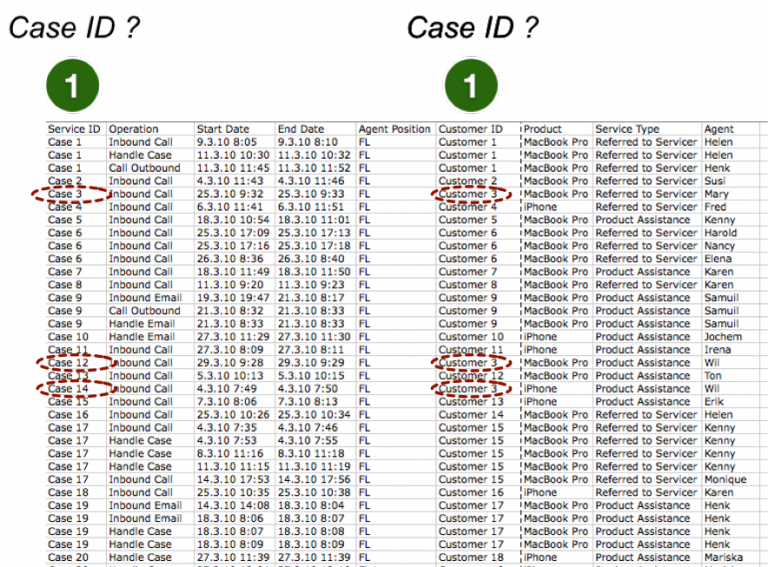 If you look at the following call center process, you would probably first set the column “Operation” as activity name. 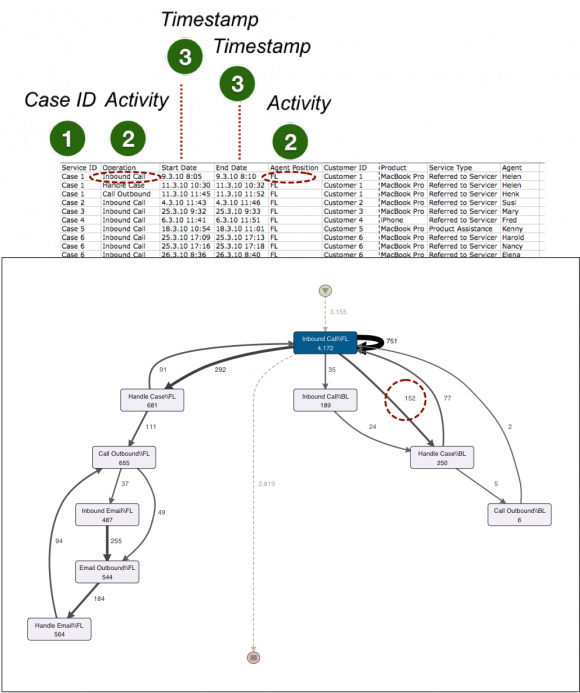 As a result, the process mining tool derives a process map with six different process steps, which represent the accepting of incoming customer calls (“Inbound Call”), the handling of emails, and internal activities (“Handle Case”). Now, imagine that you would like to analyze the process in more detail. You would like to see how many first-level support calls are passed on to the specialists in the back office of the call center. This information is actually present in the data. 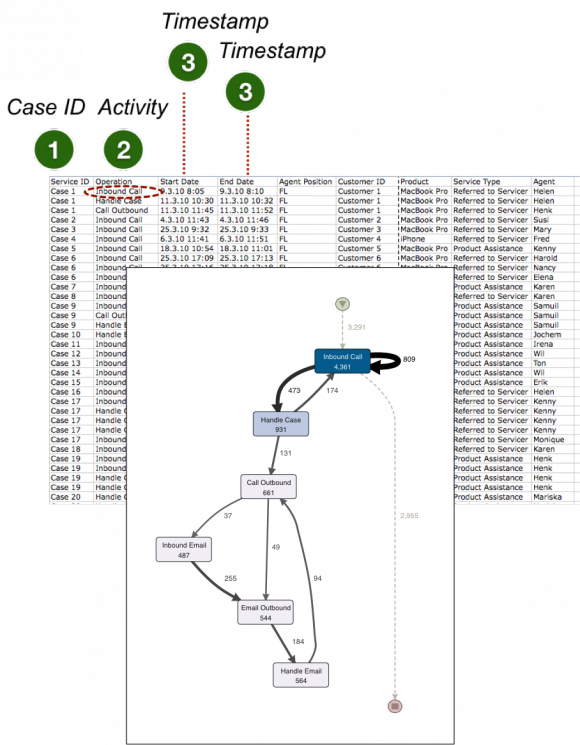 The attribute “Agent Position” indicates whether the activity was handled in the first-level support (marked as FL) or in the back office (marked as BL). To include the “Agent Position” in the activity view, you can set both the column “Operation” and the column “Agent Position” as activity name during the data import step. The contents of the two columns are now grouped together (concatenated). As a result, we get a more detailed view of the process. We see for example that calls accepted at the first-level support were transferred 152 times to the back office specialists for further processing. Furthermore, no email-related activities took place in the back office. Finally, we could question whether the service request ID of the CRM system, which was selected as the case ID, provides the desired process view for the call center process. After all, there is also a customer ID column and there are at least three different service requests noted for “Customer 3” (Case 3, Case 12 and Case 14). What if these three requests are related and the call center agents just have not bothered to find the existing case in the system and re-open it? The result would be a reduced customer satisfaction because “Customer 3” has had to repeatedly explain the problem with every call. The result would also be an embellished “First Call Resolution Rate.” The “First Call Resolution Rate” is a typical performance metric for call centers, which measures the number of times a customer problem could be solved with the first call.